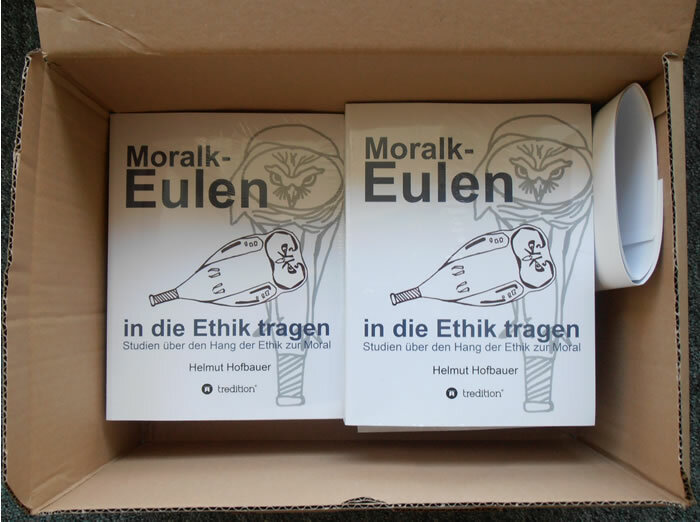 I am happy to announce that I have just published my sixth book: MoralkEulen in die Ethik tragen. 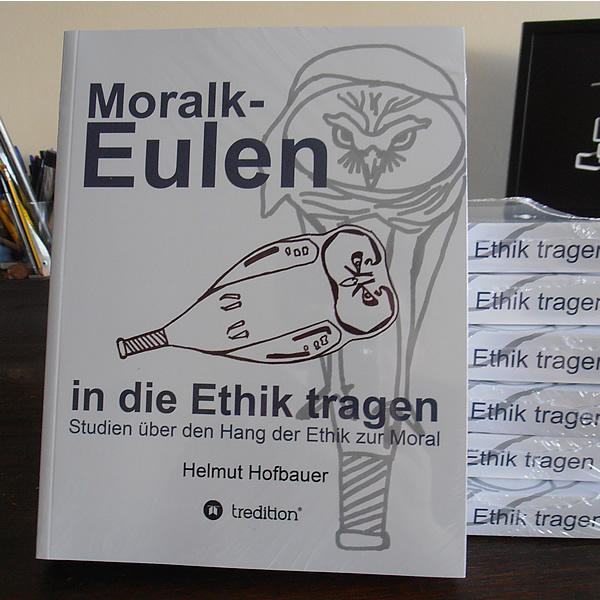 Studien über den Hang der Ethik zur Moral (364 pages , 18 EURO, tredition, Hamburg 2014). 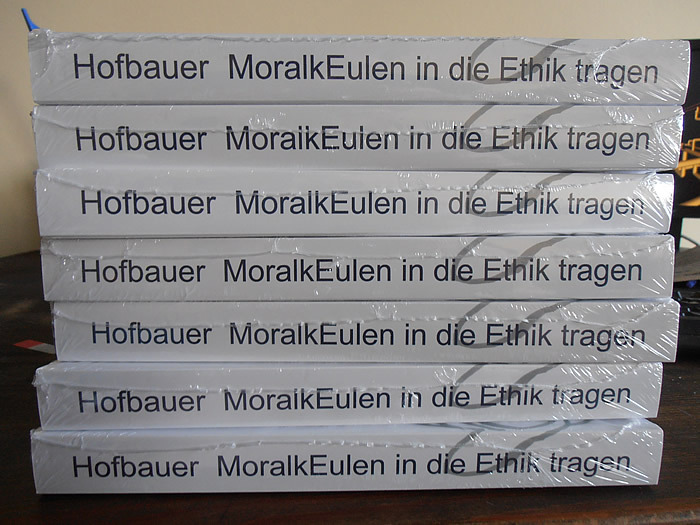 MoralkEulen in die Ethik tragen is a book on ethics. It raises the question why ethics was overruled by morals and the question of how a good human life can be lead has dropped out of ethics. The title of the book suggests that bringing moral clubs or moral bats into ethics is like bringing owls (Eulen) to Athens or coals to Newcastle. Ethics has become a moral clubs-business. But why is that so? After all, ethics has started with the question what a good human life consists of. Is the form of society we live in responsible for the school of ethics we chose for ourselves? Which ethics is appropriate for a static society and which one for a society where progress plays an important role? Which place is/was held by ethics/moral philosophy in contemporary philosophy, the philosophy of Aristotle, the philosophy of the Stoics, The Epicureans, of Plotin, of Thomas of Aquinas, of Francis Bacon, René Descartes, Thomas Hobbes, Immanuel Kant, Georg Friedrich Wilhelm Hegel, Auguste Comte, and Jean-Paul Sartre? Which questions are typical “ethical questions” according to a contemporary introductory book to that topic, and what do these questions have in common? Is testosterone responsible for Utilitarianism? Is the trend towards outsourcing responsible for the ethics boom of the last years? Does Jeremy Bentham want us to be machines? Can Excel-sheets help the Kantian to manage the moral rules he gives himself? Isn’t John Rawl’s “veil of ignorance” actually a bogus argument (because behind the veil of ignorance you would lack the concrete experience needed to decide upon those questions Rawls asks you to decide upon behind the veil of ignorance)? Doesn’t Kant’s saying of “the starry heavens above me and the moral law within me” actually means that his moral philosophy wants us to seek orientation in dimensions that are to large for our lives on planet Earth (following the stars) making it impossible for us to conceive what is in front of our noses. Didn’t Kant actually have a specific form of government in mind when he formulated his ethics (namely a liberal state where all individuals are strong, a state without women, children, old people, handicapped people and other persons that cannot satisfy Kant’s requirements for a fully valid subject of action)? Can autonomy really consist in following rules? Is ethical behavior visible in ethical surroundings? Is it ethical to require people to act ethically instead of changing the social framework in order to become an ethical one? Wasn’t Machiavelli actually a Utilitarian? Why have three of the four cardinal virtues got lost? Should ethical subjects act morally in any circumstances, even when they are exhausted and physically and psychically at the end of their forces? Why do we cultivate so many forms of one-sided communication in our present society (submitting scientific articles to journals, applying for jobs by filling out online forms, etc. ), and is our concept of ethics as morals responsible for our readiness to accept unequal communication? How does ethics manifest itself in our contemporary world (ethics committees, ethical investing, CSR (corporate social responsibility, etc. ), and what happens to the concept of human action when confronted with those examples of socially organised “good ethical practice”? By writing MoralkEulen in die Ethik tragen, I have expressed a concern which I consider to be legitimate and vital for all human beings: By excluding the question of conduct of life from ethics, contemporary moral philosophers separate us from ethics: human beings cannot do anything good if they can’t integrate it into their lives. But what is even worse: concepts of good human lives are not discussed anymore in contemporary ethics. The consequence is that people today do not think anymore about how to lead good lives. Or, sometimes they do try to think about this question, but they lack the appropriate words and concepts for doing that. They are taught by modern moral philosophy that ethically/morally good deeds are done by unspecified, unknown subjects of action possessing unknown capacities and resources. This is the manner how the program of academic philosophy to make people lose their concepts of practical reason and practical knowledge is performed nowadays. There is rarely any other theory in philosophy which I do NOT understand so entirely as utilitarianism. It is said that utilitarianism is the most developed moral theory, but to me utilitarianism makes no sense from the very start. A presentation of utilitarianism as a moral theory sounds to me as if somebody would point at a car and explain to me that in reality it is an elephant. The reason of my problems in understanding utilitarianism lies in the fact that its very first presuppositions are self-contradictory in my eyes. Here I obviously stumble over things which are sound according to the intuitions of the followers of utilitarianism. “Utilitarianism is a theory in normative ethics holding that the proper course of action is the one that maximizes utility, usually defined as maximizing happiness and reducing suffering.” (Wikipedia) The goal of utilitarianist action is to contribute to the greatest happiness of the greatest number of people. Here, at this point, there is already something I do not understand: If we work for the greatest happiness of the greatest number of people, when do we have time to be happy? If we work to produce the highest degree of utility for the greatest number of people, when do we enjoy the utility produced by us? The problem described by Benjamin Franklin in this quote in economics is called “opportunity costs”. Opportunity costs are the lost profit of one alternative of action if you choose the other alternative. In Franklin’s quote a young tradesman has chosen to enjoy his free time, and although he has only spent 6 pence during that time, Franklin calculates that in reality he has spent 6 pence and 5 shillings; for had he worked instead of being idle, he would have earned 5 shillings in this half day. From that follows that if one enjoys the fruits of his work, he fails to fulfill the utilitarianist imperative, for he would maximize utility rather by working than by enjoying. The problem in my eyes is rather that there will be no time left to consume the utility produced by us by working harder and longer hours every year. Actually, it seems to me that today’s world is aready ruled by utilitarianism. Utilitarianism is inherent in free market economy. By producing goods and providing services to others we try to maximize overall utility and are successful in falling on each others nerves. For instance with the help of advertisments. Every evening when I come home I find a staple of advertisments in my post box. I remember that all these companies try to offer something useful to me. Then I turn around and thrust the whole utility into the dustbin. Utilitarianism is part of the problem of today`s societies, and not of the solution. If I look around myself everwhere I see people trying to maximize overall utility in the utilitarianist sense. The consequences are stress, depression, psychosomatic and cardiovascular illnesses, drug abuse and a general feeling of the senselessness of life. If we really wanted to maximize pleasure and positive feelings (higher and lower ones) of all human beings, the first thing we would have to do is stop talking about the utility of all things and projects. Most important would be to stop talking about the utility of enterprises or scientific discoveries for society (“What you can do for your nation…”). Because all these utilities just add pressure to life in society and prevent people from relaxing and feeling at ease. The second important measure, if we really wanted to maximize pleasure, would be to think about the times and places when and where we can enjoy the fruits of our work and consume the utility produced by us. There have to be isles of leisure amidst the ocean of labour. Maximizing utility alone will only lead to the erasement of these isles of leisure. If we want to maximize pleasure, we have to be aware of the fact that this puts limits to the maximization of utility. As the Franklin`s trademan sometimes decides not to maximize utility by not earning those 5 shillings in order to drink a pint of beer with his friends, we should also know that pleasure can only be achieved at the cost of not always maximizing utility. My message can also be expressed in the following manner: utilitarianism is a version of consequentialism. Consequentialism holds that every human action has to be judged by the its consequences. For many people this approach is quite natural and self-evident, but not for me. Consequentialism holds that you always only do something now in order to achieve something later. So when will you be happy? If you are happy, whenever, it is always now. Happiness, pleasure, and enjoyment are always now. But for consequentialism “now” does not exist, because everything that counts is always “later”. So if you ever happen to be happy at the moment, consequentialism will send you away to do something useful, because enjoying the moment is not included in the consequentialist program.